In the first part of our series on European models of news industry innovation, Ken Doctor looks at a Finnish publisher that’s had success getting print readers to pay for online access. The news business is an insular one. It is still largely bound by national borders, one of the few industries largely uninfluenced by the rampant globalization of business. That’s beginning to change (“The newsonomics of the global media imperative“), but slowly, and only for a relative handful of companies. News Corp., the largest news company in revenues worldwide, is the most diversified, with 44 percent of revenues in Europe, the Middle East, and Africa, 39 percent in the Americas, and 17 percent in Asia Pacific. Gannett, the largest U.S. news publisher and second worldwide, is a little bit global, taking in about 14 percent of its revenues from its U.K. Newsquest division. But even if most companies aren’t global, the issues they face are. Except in the fastest-growing markets — Brazil, Latin America more generally, and parts of Asia — the business trends are starkly similar. In European innovation, Americans can see models worth learning from and adapting. Talk to the Europeans and Brits and the conversations parallel those in the States: shrinking print circulation; declining classifieds; print ad revenues dropping steadily. While mobile is booming, it generates small revenues for news companies. Even as the audience moves more strongly digital — many European countries sport higher broadband penetration than the U.S. — many publishers are behind the reader curve and have harvested only a little mobile ad revenue. Part 1: Sanoma, Finland’s largest news company, is an early leader in charging for digital access, having signed up — and charged a premium to — a third of the print subscribers to its Helsinki daily, the leading paper by circulation in Scandinavia. Part 2: Schibsted, the eighth-largest news company in the world by revenues, just behind The New York Times Co., now operates in 28 countries. A full 36 percent of its revenues come from digital offerings — a number more than three times that of the average newspaper company. Part 3: Zeitung Online, a tiny news company with a “micronewspaper” model, just beginning to syndicate its platform and thinking. It serves as a useful digital-first example for startups of all kinds and, especially, for smaller community newspapers, which often get short shrift in thinking about news’ digital transition. Sanoma is a highly diversified media and learning company, with about 16 percent of revenues coming from newspapers, the rest in magazines, broadcast, education, and B2B. It earns 49 percent of its revenue in Finland, its home country, a small nation of more than 5 million. The Netherlands contributes another 26 percent, with Hungary, Belgium, Poland, and Russia among the other countries in which Sanoma now has a presence. It betters most of its peers on one key figure, earning 16 percent of its revenues from digital sources. Those revenues, as evidenced in the Tuesday’s release of its annual report, have helped keep both its news-based and overall businesses fairly flat, as European economic headwinds make growth even tougher to achieve. Publishers used to joke that “flat is the new up” — but in the grimness of print ad decline, we don’t hear that joke much anymore. So Sanoma is doing better than its peers. What sets Sanoma apart is the success it has had with upselling its print subscribers. In the U.S., most newspapers that have dared to charge for digital content have bundled it for free with a print subscription. But even print subscribers of Sanoma’s Helsingin Sanomat must pay an extra €36 a year (about $48) to get digital access — online, iPad, and mobile. Helsingin Sanomat, also known as HS or Hesari, is the largest paper in Scandinavia; Sanoma owns the second and fourth leading websites in Finland. The price point is €340 (about $450) a year for all-access, print and digital, versus €304 for seven-day print only. Of the 390,000 subscribers to the print edition, 130,000 — a third — have taken the upcharge. That’s resulted in a substantial new revenue stream. Helsingin Sanomat’s latest iPad product debuted Feb. 2, adding ads to the product for the first time. It also incorporates rich media ads and news videos from Sanoma’s Finnish TV station Nelonen, itself a fast grower, with 8.5 percent compounded growth in sales over the last five years. Helsingin Sanomat now has two iPad apps, the second a photo/video one. “We’re trying to introduce a new reading habit,” says Marja-Leena Tuomola, who in 2011 took on the post of chief digital officer for Sanoma’s Finnish media operations in a company reorg. She notes that by late summer, 60,000 to 80,000 iPads had been sold in the country, enough for the company to make its move. The company is actively working on an HTML5 transition, with plans to introduce that version early this year. The company aims to add personalization to its digital online version this spring. HS began its paid program a long time ago by newspaper standards — 2008. Significantly, it also includes full access to its archives with the digital subscription, and it makes that a key selling point. Although The Wall Street Journal and the FT were charging for digital access four years ago, general newspapers weren’t. The European industry reaction was straightforward: “No one believed us at the beginning,” says Tuomola. How does Sanoma upsell its print subscribers? Customers are repeatedly told that, in the land of Nokia, they’d be silly not to take the package and pay a little more for substantial value. “There is no reason to buy print only. It’s a fantastic value proposition.” That message has sunk in. Check out its subscription page to see how it does its bundling and selling. The company makes a point of the upsell “in every possible way,” including outbound telesales, mail and email offers, and print and banner campaigns. “We sell mainly hybrid packages (print + online + tablet + mobile). If you really insist on having print only, you will get it,” says Tuomola. But you have to really insist. Interestingly, it took time to build. Eighteen months after introducing the package, the company moved into high marketing gear. Now Sanoma is much farther along in its digital transition, though it’s got a long way to go. One key to that, Tuomola believes, is to recreate the scarcity value of high-quality ads on the tablet, as long as “they don’t ruin the experience.” In addition, more value could be harvested from new digital services, harvesting the value of the consumer database for online classifieds and other products. In 2011, Sanoma completed a major reorganization, dividing itself into seven strategic business units. Tuomola moved to her new post in mid-2011 — working three months of “24-hour days,” she says — from a position as senior vice president for business and digital operations development. Like RCS, the largest newspaper company in Italy, the renewed focus on the digital future is taking the form of specific “digital matrix” responsibility for growing that part of the business. In an interesting turn, in 2010, it became one of the first newspaper companies to publish its annual report as an iPad app. Overall, the company can claim great reach in its home market, even with younger people. 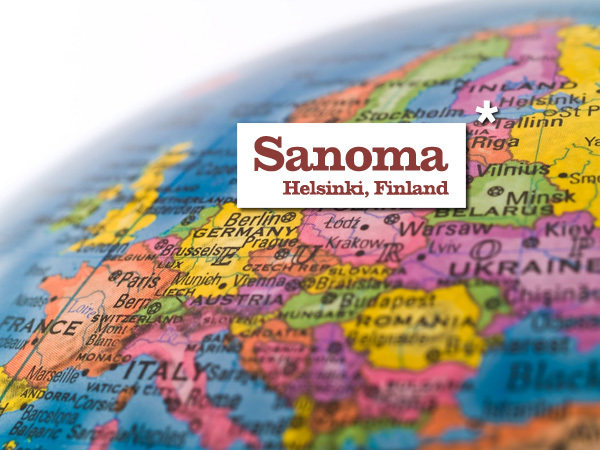 Sanoma News print and digital products reach 70 percent of all Finns and 93 percent of people in Southern Finland. With online services, Sanoma News has reach of more than 80 percent among 20–29-year olds. Unsurprisingly, its print products have their highest reach among 50–59 year olds. The key model here is forcing the all-access revolution. In choosing to price up for digital, even as its mobile products are in their infancy, it sent a strong signal to the market. Now with a third of print subscribers paying for print + digital, it can see a big accomplishment ahead: the time when more than a majority of subscribers become true hybrid print/digital customers. 33 percent of print subscribers take the upsell package. Fewer than 100,000 tablets have been sold into the Finnish market, but Sanoma rapidly incorporated iPad products into that market to get ahead of, or at least stay even with the emerging audience. €36 a year from 130,000 customers, the price paid for the upsell, is an impressive new revenue stream and should only be a foundation for growth. Seize the opportunity to make print customers digital customers as well. Make customers an offer they can’t refuse — and support it through integrated marketing and customer service. Develop mobile products — ones that greatly support the all-access pitch — early. Tomorrow: Schibsted, the eighth-largest news company in the world by revenues, generates 36 percent of its revenues from digital offerings, far ahead of most of its peers. How has it achieved global leadership in classifieds and services? Doctor, Ken. "Looking to Europe for news-industry innovation, Part 1: Sanoma’s big bundled success." Nieman Journalism Lab. Nieman Foundation for Journalism at Harvard, 13 Feb. 2012. Web. 19 Apr. 2019. Doctor, Ken. "Looking to Europe for news-industry innovation, Part 1: Sanoma’s big bundled success." Nieman Journalism Lab. Last modified February 13, 2012. Accessed April 19, 2019. https://www.niemanlab.org/2012/02/looking-to-europe-for-news-industry-innovation-part-1-sanomas-big-bundled-success/.